So, why would you ever buy a steam mop? If you’re like most people, you’re thinking that the last thing you need is yet another “handy” household device. You may be rolling your eyes right now just thinking about all of the expensive gadgets cluttering up your closet or garage. Unless your name is Mary Poppins, cleaning the house is likely just a tedious hurdle that stands between you and the fun part of the weekend. Adding extra equipment (that may or may not do what it’s supposed to do) just makes it worse. However, if you have tile floors, you may want to reconsider the steam mop, especially if there are small children living in your house. Tile floors look great, but they’re not always easy to clean. They’ve got all these in-between places to scrub out, and it can be hard to tell whether or not you’re getting at all the germs and bacteria. The grout in between tiles can also get discolored over time, and it takes serious scrubbing to restore neglected tiles back to their former glory. 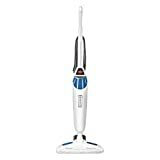 But with a good steam mop, such as our top pick, the Bissell PowerFresh Steam Mop 1940, you can get a deeper clean faster, and even stuck-on spills can be eliminated with very little effort. The best part is that, with a steam mop, you can clean and sanitize your floor without having to use harsh chemicals. This is why steam mops are so convenient to use in spaces where children will be playing and in the homes of those who suffer from respiratory problems. Finally, using a steam mop on your tile floors will make them look new and sparkly. Even your mother-in-law will be impressed. Of course, a lot of your steam mopping success will depend on choosing the best device for your needs. Steam mops come in a number of different varieties and price points, and it’s important to pick the one that will give you the biggest return on your investment. Steam mops will only sanitize your floor when used correctly, and some are a lot easier to use than others. Some mops also work faster than others. And if you look at customer reviews, you’ll quickly notice that one of the biggest complaints about certain steam mops is that they don’t last, which is a very understandable complaint. Who wants to spend money on a product that they end up loving, only to have it conk out in two months? Not you. What Makes for a Quality Steam Mop? When it comes to finding your perfect steam mop, you’ll need to consider size, price, and performance. A giant, industrial steamer may clean floors like nobody’s business, but it won’t do you much good if it won’t even fit in your bathroom. Whereas, a little hand-held mop might do fine in a tiny bathroom in a studio apartment, but be less than ideal in an enormous kitchen. As far as price goes, you may be pleasantly surprised to find out that some of the best-reviewed steam mops aren’t the most expensive – not by a long shot. But, you don’t want to go to cheap either. After all, even a bargain steam mop isn’t a very good deal if it breaks on you in a week. Instead, investing just a little more in a really solid machine will more than likely pay off in the end. When you start shopping for your mop, remember that a good steam mop will be ready to use quickly, meaning that the water should heat up fast. Also, if you’re going to be tackling a bigger space, you’re going to want a longer cord, and a bigger reservoir will also come in handy. Having a removable tank will also help make refilling easier. Being able to adjust steam levels is a must, and your winning steam mop should come with some decent accessories and a good warranty. Don’t let the appearance fool you. This is a super simple mop to own an operate. It has no trigger to hold, requires no cleaning chemicals, and only takes 30 seconds to fully heat up. You literally unwind the cord, plug it in, wait half a minute, and start cleaning. The mop inlcudes what is called the EasyScrubber. This is essentially a flip down scrubber at the back of the mop pad for removing stubborn stuck on residue. There is also a carpet glide carpet freshening attachment available for the mop. Check your retailer’s advertisement closely before purchasing to be sure whether or not this attachment is included. It’s not a standard item and is usually sold separately. There are couple minor drawbacks to the design of the mop that stand out for me. The buttons for the 3 level buttons is on the lower front which means you’ll have to a little bending over and reaching to change settings. Also, the unit doesn’t include an off switch so you’ll need to remember to unplug it when you’re done. With an excellent price point, stellar reviews and all of the bells and whistles that you’ll actually need in a steam mop, this entry is the hands-down favorite. It’s ideal for both smaller and larger spaces, and it’s remarkably easy to use. Heck, it even smells good. What more could you ask for in a cleaning device? This mop is just one feature away from being our top pick. If only it had a removable water tank it would honestly best the Bissell. The problem with not having a removable water tank is that you have to turn the unit upside down to drain any remaining water before you can store it. Provided you plan for it and only fill what you’re going to use this wont be an issue. It will take some trial and error though. Other than that little caveat, it meets all the same pros and cons of the Bissell. It has 3 variable steam settings that allow you to clean pretty much any floor. While it doesn’t have a flip down scrubber it does have a steam jet and microfiber pads with a deep nap to get into tile grout. It also suffers from the same lower front placement of all of the controls. Honestly, you can’t go wrong with either mop. If you can live with the fixed tank you’ll benefit from the lighter weight, electric controls, and double sided cleaning pad. Not a bad trade off in our book, but it’s ultimately up to you decide which is more important. If it seems that the SmartSelect bears a striking resemblance to the Bissell PowerFresh, your eyes aren’t deceiving you. These two steam mops have a lot in common. That’s why this Black and Decker product was the natural choice for our alternative evaluation. The unit has 3 level settings called Tile/Vinyl, Stone/Marble, and Wood/Laminate which are basically High, Medium, and Low. It has a removable water tank that changes illumination when empty to provide an easy visual indication. It also has an on/off button and cooling pad unlike the Bissell. Unfortunatley, the unit is a bit underpowered compared to the Bissell and has been reported to have a higher failure rate. The top side of being underpowered is you’re not likely to accidentally fry your laminate or hardwood floor if you accidentally start on the high setting. It may not smell as good as the PowerFresh, but the SmartSelect comes with a quick-release cord and an awesome soft-grip handle. Drop-It tank emptying system that lets you empty the vacuum canister without needing to reach into anything. Adjustable handle to reach under tables, beds, etc..
We realize that a lot of our readers have fur-babies instead of human babies, or fur-babies in addition to human babies. This is why we chose a tough product that can serve double-duty as our premium option. Four-legged family members are lovable, but they can be messy. That’s why this Bissell product is a good option for homes with multiple pets. It can clean and sanitize floors, and pick up fur, dust, and dander all at the same time. 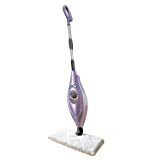 This is also a great choice for anyone who finds it annoying to have to sweep/vacuum a floor before steam mopping it. On top of being a vacuum and steam mop in one, there are some other advantages to this unit. For starters, you can use it as just a vacuum. Since the steam is triggered by a trigger you’re not forced to use that function. Though some may find having to hold that trigger down when steam cleaning a little annoying. Also, the Bissell allows you to optionally use Swiffer disposable pads. This is accomplished using a second easily attachable head that snaps together to hold the Swiffer pad. On the down side, the water tank isn’t removable. To fill it you’ll need to remove it. Fortunately the water port is on the top of the unit so you can fill it while it’s standing up. You also need to keep in mind that this unit is a jack of all trades but master of none. It’s an ok vacuum and an ok steam mop. 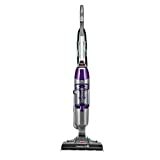 If you want an amazing steam mop you’ll want to pick up a dedicated one like the Bissell PowerFresh above. All that being said, if you’re short on time and long on cash the Symphony is a great choice. Dirt Devil EasySteam Fixed Handle Steam Mop – Sure, the price is right, but most buyers have complained that the performance is severely lacking. This is a little surprising because Dirt Devil has been making quality products for a long time. However, this steam mop apparently doesn’t heat properly and breaks quickly. This just goes to show that you can’t win ‘em all. Our suggestion is to look to Dirt Devil for your vacuuming needs, but probably elsewhere for steam mops. Pyle Multi-Purpose and Multi-Surface Steam Mop – This product comes with an impressive-sounding name and a price tag to match – It costs more than our Top Pick. However, this Pyle steam mop delivers a disappointing performance. Many buyers have complained that it leaves a lot of water on floors, effectively forcing users to clean up after cleaning up. The tank is also reported to deplete rapidly, which makes sense because, obviously, all of the water ends up on the floor. No matter what type of steam mop you decide to bring into your home to clean your tile floors, remember that reading the instructions carefully is always important. Yes, a truly good product should be easy to use and come with good customer support, but it’s still important to read the owner’s manual. For example, if distilled water is called for, use distilled water. All products will last longer if at least minimal effort is made to take care of them. The shark handle design is garbage. Since the shark cannot stand on its own, it is only a matter of time before it falls over and smashes the delicate round handle. Ours has been taped back together multiple times. I am looking at your web site because the handle broke again today and my wife is done with the shark.